The world premiere of REDWOLF by Amy Sass and Anthony Clarvoe (PlayGround Faculty) has been called "brutal", "sensual" and "compassionate". Come out for our final weekend Friday, Nov 7 at 8 pm and Saturday, Nov. 8 at 2 pm and 8 pm. The Saturday matinee is Pay What You Can for students and educators with a post-show discussion afterwards: Predator & Prey: In Bed With Red Riding Hood. For tickets: go to www.raggedwing.org. Bublitz will also join the line-up for Playwright Foundation's 5th Annual One Minute Play Festival coming up on December 15th and 16th at the Brava Theater Center (http://playwrightsfoundation.org/index.php?p=227). Cindy Goldfield just directed The Boyfriend for 42nd Street Moon and begins rehearsal for her 11th season of A Christmas Carol at A.C.T. Mary Baird has a busy end of the year going into 2015. She is doing a workshop/reading of ASPERN PAPERS at A.C.T, Dec 1-7. 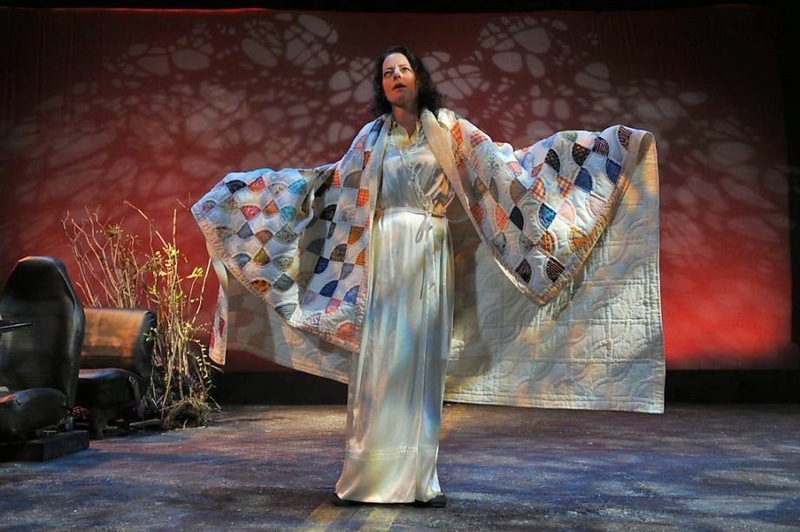 Next up, she’ll perform in INDIA INK, coming to A.C.T. early next year. And on Dec 13, she’ll perform in a straged reading of A CHRISTMAS STORY with fellow PlayGrounder Michael Barrett Austin at St Johns Church in Ross. Colin Johnson is writing and directing Typhon for the San Francisco Olympians Festival Wednesday, Nov 12 at the EXIT Theatre. Liz Anderson completed principle photography for the WWII/SciFi film she is directing entitled The Toll. PlayGround's 6th Annual Musical Theatre Night Topic! Who Could Ask For Anything More?! 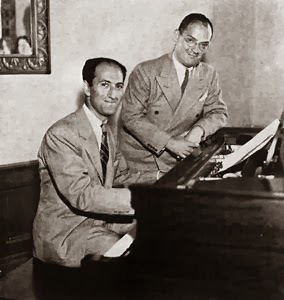 PlayGround writers will again draw from the music of George and Ira Gershwin for their inspiration for the sixth annual Monday Night PlayGround Musical Theatre Night, taking place at 8pm, Monday, November 17 at Berkeley Repertory Theatre. Writers have four days to generate their original scripts, inspired by the topic “Nice Work If You Can Get It” and the songs of the current Broadway touring show of the same name, including some of the greatest music written for the musical theatre – Someone to Watch Over Me, Let’s Call the Whole Thing Off, ‘S Wonderful, and the title song Nice Work If You Can Get It, among others. Performed on the set of Berkeley Rep’s current show, the Monday Night PlayGround performances will include accompaniment by noted Bay Area pianist and arranger Steve Sanders (1776, The Gershwins’ Porgy and Bess). Tickets and discount season subscriptions can be purchased online at http://playground-sf.org/boxoffice. TICKETS: $15 general admission ($20, priority seating) in advance, $20 at the door. Pay-What-You-Can at the door beginning one hour before the performance, subject to availability. 6-pack flex subscriptions are just $60 (50% off priority seating). For more information about the Monday Night PlayGround series, call (415) 992-6677 or visit www.PlayGround-sf.org. The people have spoken... The October People's Choice Award goes to Maury Zeff for his short play, The Universe on Ice, presented as a staged reading at the Monday Night PlayGround season opener/inaugural Planet Earth New Play Festival on October 20 at Berkeley Rep. Congratulations, Maury! NARRATOR – Male – 30s to 50s – Any race – Physically imposing. Stentorian British accent, the most authoritative voice you’ve ever heard. Reminiscent of the very self-assured, stodgy narrators from documentaries of an earlier era. SIR ERNEST SHACKLETON – Male – 30s to 50s – Caucasian – Hearty, sturdy, stocky. The great polar explorer. British accent with the mildest Irish brogue. Unflaggingly confident, relentlessly ambitious, ravenously hungry. Focused on the singular goal of reaching the South Pole. REAR ADMIRAL ROBERT E. PEARY – Male – 30s to 50s – Caucasian – Physically imposing. American, with a vague, ironic resemblance to a walrus. The slightly less great polar explorer. Ruthlessly ambitious, occasionally lecherous, ravenously hungry. Desperately wants to reach the pole—the northern one. POLAR BEAR – Female – Any age – Any race – Physically imposing. Maternal figure, protective, gentle. Wants to know how the hell she got here, but, even more, wants to protect her family and home. Is it to be believed? 90 degrees South, 0 degrees West? Have I finally reached the pole? Antarctica is the endemic habitat of the Emperor Penguin, penguindom’s largest species. Phylum Chordata. The female of the species lays a 13.5 centimeter egg that the exhausted bird transfers to the male, who incubates the egg for sixty-four days during the long Antarctic winter. (Reaching for his rifle) Fresh meat! (Trying to protect egg with flippers) Whoa, easy, Ernie! I’m going to be a daddy. You know my name? Wait…What am I saying? You bloody speak?...English? I must be hallucinating. Three days wandering in this cold and snow will do that to a man. (Studying his compass) 90 degrees North, 0 degrees West. At long last, I’ve reached the pole. Ah, Commander Peary, conqueror of the Arctic. (Aside) In your mind, at least. A penguin? At the North Pole? Preposterous. You’re not supposed to be here. I’m not supposed to be here? I’m not the one whose ambient scrotum temperature is 12 degrees. (Raising his gun toward PENGUIN) Well, it makes no difference. Fresh meat is fresh meat. (Waving his flippers) Hey, hey, I’m incubating an egg here! (Looking through the site of his gun) Splendid. An omelet too. Do I come into your home and wave a gun in your face, threatening your family? (Clears throat; to Peary; as Jerry Seinfeld used to say to Newman) Hellooooo…Peary. (Coolly) It’s an honor, Sir Ernest. Join us for the next Monday Night PlayGround on Monday, November 17, at Berkeley Rep and choose your own favorite. Click here for more info.